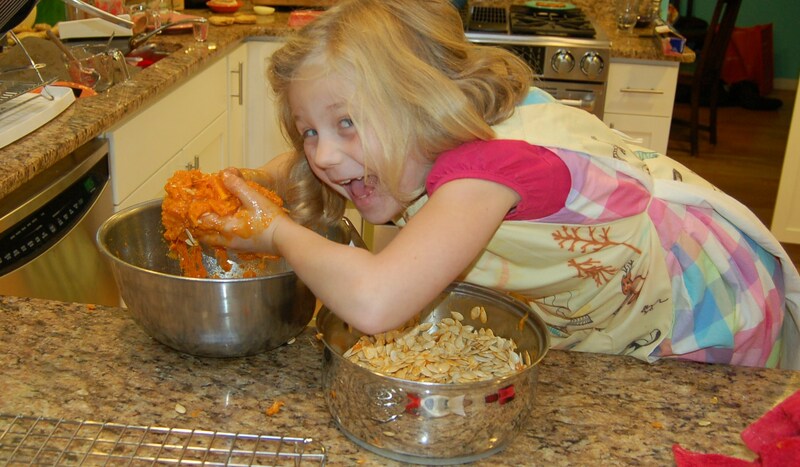 Pumpkin guts - "Mwaa ha ha ha"
We baked the sugar pumpkins and will puree the pumpkin meat for pies and muffins. We also saved the seeds and roasted them with a little olive oil and salt for snacking. Here are the remaining squash harvested from my garden. I’ve got one fat spaghetti squash, one Waltham butternut, and a few Delicata. It’s probably not bad that we have a small squash crop since I’m the only squash eater in the family. More for me I guess! Have you started cooking with squash yet this season? What are your favorite ways to cook and eat squash? This entry was posted in Cooking & food preservation and tagged pumpkins, squash. Bookmark the permalink. That is a devilish (but happy) smile on her face! I ended up with absolutely no winter squash this year – only a few pie pumpkins. Like your household, now that my daughter has moved away I am the only one that actually likes squash so I have to be careful not to plant too much now as otherwise it would be wasted. However, zero was definitely too little! My favorite way to eat winter squash is to BBQ it. I slice a butternut squash in half and scrap out the seeds. Then I slice it into 1/2 inch or less slices. Toss in olive oil and then cook on the BBQ until soft. The first time I tried it people looked at me like i was crazy (I’m use to looks like that), but then everyone loved it. 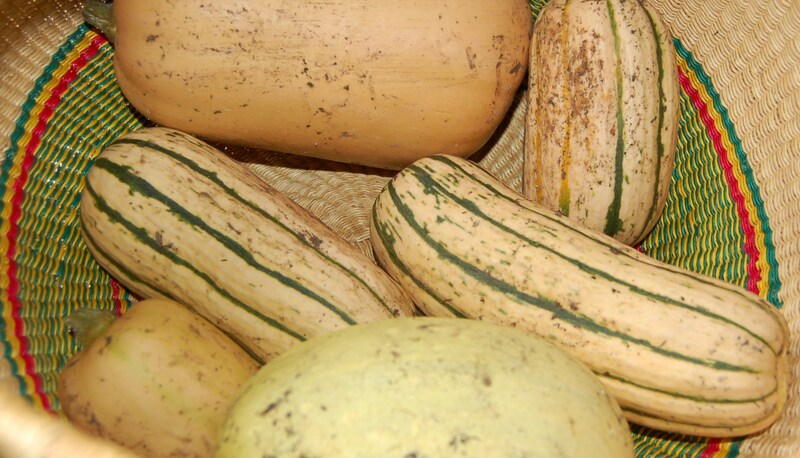 Even those to don’t like squash had multiples. I went through two nice sized butternut squashes faster than pumpkin pie. You could peel the squash before slicing it to make it easier to eat.